Here's a venison burger recipe that outsmarts the lean-meat patty problem. It involves an egg, flavored bread crumbs and two little twists on tradition. A burger recipe is a pretty straightforward set of ingredients and instructions. Still, burger patties made with ground venison can present problems, namely the meat is so lean it doesn't hold together well. A lot of the guys in my hometown add fat to their venison to address this issue but, dang, this seems like the most counterintuitive thing ever. You've gone to the effort to hunt an animal in the wild, the meat is organic, lean, top-shelf stuff. Then you arguably devalue it with, say, pork fat. So let's outsmart the lean-meat patty problem, and let's do it without adding fat. There are many ways to accomplish this. I like going the egg and breadcrumb route. I've heard stories from some of the old guys in my hometown who grew up in the Depression Era. They add breadcrumbs to any burger, even if it's not necessary, just because it's what they've grown to like. Their mothers used the bread to stretch the number of patties they could make when many families couldn't afford to buy or butcher the volume of meat they needed. There are two other little tricks that come in handy when preparing a good venison burger. These can help offset a lean burger's tendency to come off the grill dry. I'll get to both in the instructions below. You're basically making meatloaf without the ketchup. I bake burgers at 350 degrees for 20 to 30 minutes. You may want to leave them in for less time, depending on how rare you like your burgers. First, combine the egg, onion, breadcrumbs, crushed garlic, salt, pepper and venison in a mixing bowl. You can patty the burgers in the traditional way or you can mix things up and make little burger bowls. The bowls are fun and help maintain the venison's moisture. You may have heard others refer to these as beer burgers because some use a beer can to make the "bowl." This is done by balling the patty meat first, then pressing its center with the bottom of a beer can to form a bowl. If you choose to go the burger-bowl route, don't add the chopped onion to your ground-burger mix. Instead, leave them out when prepping the ground venison mixture and sauté the onion in oil with mushrooms until they're nice and tender. Place the onions and mushrooms in each patty bowl. Next, wrap the outside of the burger bowl in bacon and top it with a slice of cheese. I used pepper jack. Here's another little twist: consider baking the burgers. I know, I hate that. In my view, burgers should be grilled. And most of the time, grilling is what I choose to do. 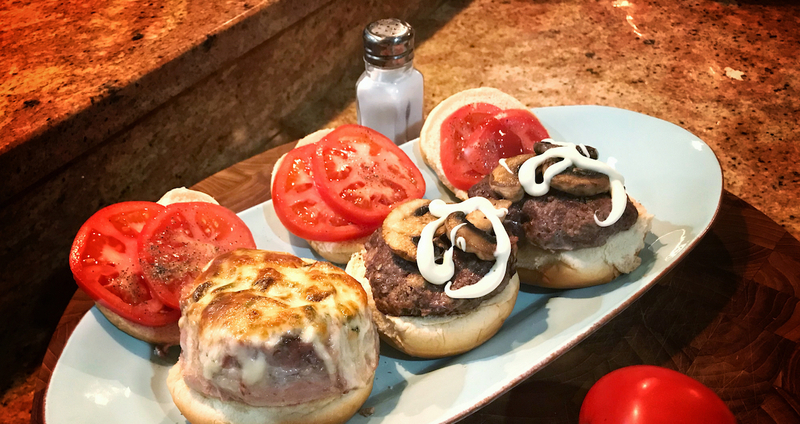 But in the winter months, when it's just not inviting to go out and fire up the grill, it's nice to be able to make burgers at home and have an alternative. Plus, when using ground venison for burgers, this alternative becomes even more compelling. If you find your venison burgers tend to be too dry, baking the burger will help.